The MP, who took the seat of Moray from the SNP's depute leader Angus Robertson in June's election, made the comment in a Meet the MPs interview with Core Politics, which was then posted on YouTube. In the interview, which featured a series of short answers to a range of questions spanning music to politics, Mr Ross was asked: "If you were prime minister for the day, without any repercussions, what would you do?" The former Moray councillor and regional MSP responded: "I would like to see tougher enforcement against Gypsy travellers", before the video immediately cut to the next question. This drew criticism from Amnesty International, who said the remark was "divisive and the sort of inflammatory rhetoric that creates barriers rather than offering positive solutions to issues in communities". The Traveller's Times called it a "blatant display of anti-Gypsyism" which "only serves to contribute to the high levels of intolerance and racism directed towards Gypsies and travellers in society". Mr Ross - a qualified Scottish Football Association referee who has worked as a linesman in a number of high-profile fixtures - has also been reported to the SFA's compliance officer. He is currently scheduled to officiate as a linesman at the Celtic v St Johnstone fixture in the Scottish Premiership on Saturday. 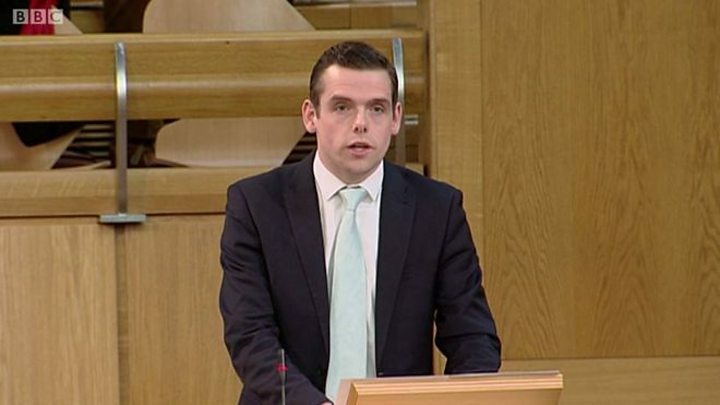 In an interview with the BBC's Good Morning Scotland programme, the MP apologised, saying enforcement would in fact be a "very low" priority were he prime minister for the day. He said: "If I had my time again of course I would have picked a different number one priority in the hypothetical situation of being prime minister for the day. However, this was an issue I was dealing with at the time for constituents, and it is an important issue in communities within Scotland and right across the UK. "I do apologise for saying that would be a number one priority as prime minister, that clearly wouldn't be the case for any prime minister." However, Mr Ross insisted that illicit encampments remained a "significant problem" in his constituency, suggesting that travellers who flout planning and land use rules are given preferential treatment on the basis of their protected status as a minority group. Moray has traditionally had a high number of gypsy traveller camps relative to its size, but does not have any legal halting sites. However, a Gypsy site that was built without formal permission in 2016 was allowed to stay in place. The MP said: "They are an ethnic minority, therefore when they turn up on land that is not theirs and establish illegal and unauthorised traveller encampments, they are protected, yet the settled community, if they were to do the same, are not protected. "This is where you get divisions within communities, because they see one rule for the travelling community and one rule for the settled community. "In terms of legislation to remove them from unauthorised, illegal encampments, they do receive preferential treatment. "Because you have to go to the courts to get permission to get them to leave your own land, you have to pay for clear-up - many times when they leave the area in a significant mess. "This all has to be paid for by the local taxpayers, who want to see something done to ensure that these individuals - who give a bad name to all travellers - are dealt with to ensure we can have a better relationship between the travelling community and the settled community." Ben Bennett, a 13-year-old Romany Gypsy, wrote to Mr Ross asking him to explain the comments. He told BBC Scotland: "It disturbed me quite a bit how he could want to single out my community as a whole, in his words, needing tighter enforcement. "I felt like he was singling out me, because I'm a member of the Gypsy and travelling community; why would I need more enforcement? I'm not doing anything wrong. I took it quite personally because he was singling out my community." Mr Bennett said Gypsy youths are "constantly facing hate crime". He said: "Going to school I've been physically attacked, I've been isolated from classrooms just because of my ethnicity by teachers; when I've asked why I've been isolated they've said students don't feel comfortable being around a 'pikey'." Mr Ross wrote back to the teenager saying he was sorry "for any distress" caused, but maintaining that a "significant" number of local people had highlighted issues with "a lack of enforcement against a small number of travellers who give all travellers a bad name". The MP told the BBC that it was important people did not shy away from debating the issue for fear of being called racist. He said: "This is an issue that needs to be addressed. It's unfortunate that we can't openly discuss this issue for fear of being called a bigot and a racist. "If we do that then no-one will ever mention this again, and the divisions within these communities will maintain. "The settled community will feel their voice does not get raised in this argument, and the continuing problems with the Gypsy traveller community will continue because nobody is willing to debate and discuss this important issue."